There are two play areas in the park. The one illustrated on the right is located outside the cafe and is suitable for children aged 2 - 6 years old. 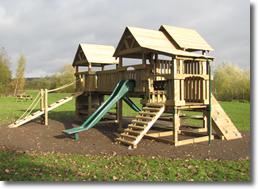 This provides a multi-play unit with two slides, a ramp, ladders and mini climbing walls. 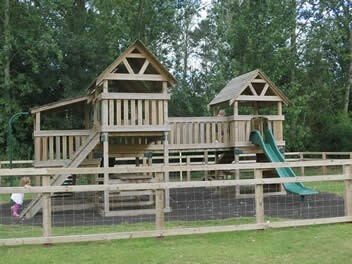 In the same enclosure children can use parallel bars, a fibreglass climbing boulder and a large chestnut log. 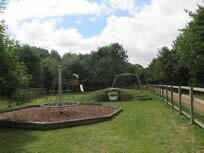 Adjacent to this play area, in the strip of woodland, there is a skate park and basketball ring aimed at older children. This area was built as the result a joint funded project by WREN, Bedford Borough Council and The Friends of HOCP. 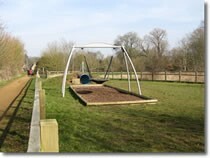 A second play area for older children aged 8-13 years is located near the Odell entrance to the Park. This can be reached from either the main car park or the upper car park by following the bridleway. 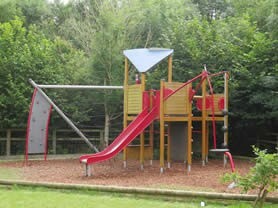 This contains a witches-hat shaped roundabout & rope climb, a tunnel, a basket swing & multi-climb unit. Note that there is pedestrian access to this play area from Odell but no parking is available. 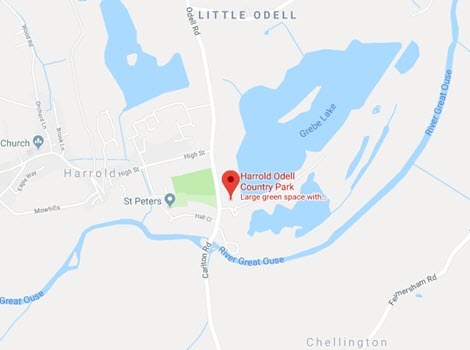 Visitors are advised to use the main entrance to the Park in Harrold and then to park cars in the upper car park. This is open all day but is locked after 5.00pm. The main car park is open 24 hours. Skate Park - this is located in the strip of trees that runs behind and away from the Visitors' Centre to which it is connected by a good path. There is also a basketball ring in this area. • Barbeques are not allowed anywhere in the Park.